What Day Of The Week Is October 20? 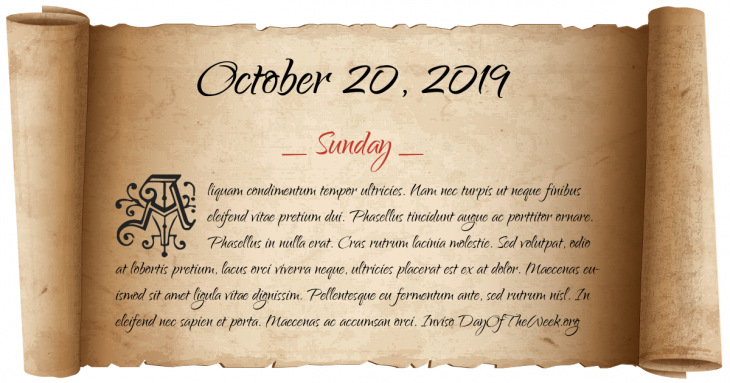 October 20, 2019 is the 293rd day of the year 2019 in the Gregorian calendar. There are 72 days remaining until the end of the year. The day of the week is Sunday. The hull of the RMS Olympic, sister-ship to the ill-fated RMS Titanic, is launched from the Harland and Wolff shipyard in Belfast, Northern Ireland. Pope Pius XII publishes his first major encyclical entitled Summi Pontificatus. World War II: Thousands of civilians in Kragujevac in German-occupied Serbia are killed in the Kragujevac massacre. China launches simultaneous offensives in Ladakh and across the McMahon Line, beginning the Sino-Indian War. The Oakland Hills firestorm kills 25 and destroys 3,469 homes and apartments, causing more than $2 billion in damage. Who were born on October 20?